One of the very first things I experimented with in my early days in the kitchen were perogies. I grew up eating them and knew I had to learn how to make them from scratch. Perogies are not hard to make but there is a definite learning curve when it comes to good perogy dough. Many of the recipes you find are extremely tough to roll out. It took a lot of recipe experimentation before I finally found a dough that I love to work with. It is shockingly simple. As it should be. The love comes in the filling! You can really have fun and do a lot of flavor experimentation when it comes to what you put inside your perogy. From sweet to savory the combinations are endless. A quick note about why I have made the switch to using organic fruit. Just over a year ago I had to rush my son who was 10 at the time to the hospital after he had a nectarine as a bed time snack. About 30 minutes after he ate it he came upstairs wheezing badly, extremely flushed and very itchy. Talking with him later, he said his mouth felt itchy after the first bite. The moment we got to the hospital they whisked him away even before the paperwork had been filled out. He was in full Anaphylactic shock. Allergy tests were ordered, I assumed it would come back positive for a stone fruit allergy. Negative. The only thing that came back was an allergy to birch trees. Birch trees? Not sure what to think we just starting being very aware of what he was eating and drinking. He was very good at avoiding all things that contained stone fruit. Then one day as he was eating green grapes, his mouth began to tingle. That is when we started to experiement and keep track of the fruits he was reacting to. Next to bring on the dreaded mouth tingle was strawberries. At that point he started to only eat fruits with skins that are not consumed, melons, bananas, etc. One day he had mentioned how much he missed eating strawberries. I started exploring some organic options. In a perfect world I would be able to have a year round garden and grow all my own food. Unfortunately living in Northern Canada that is not an option. I looked around the grocery stores in Grande Prairie and I have to say, the organic choices are very limited. But I did find some strawberries and was very excited to get them for the boy. He was a bit nervous, the night he had his sever reaction was not far from his thoughts. I assured him that with the fruit being organic he would be fine. And to be honest, I was nervous as well. In my eyes it was the ultimate test if organic was truly organic. If I remember correctly, he ate the whole tub! Which was fantastic. Then I started thinking about all the chemicals we were comsuming. Scary. And we would still be comsuming them had Tyler not had that inital reaction. No matter how much you wash your fruit, how clean you think it is, is it really? Not willing to take that chance I have started buying only organic fruit. For this recipe I used frozen organic blueberries. Only use water if you are using fresh blueberries. Cook over low heat until the blueberries come to a boil. Reduce heat and simmer 2 minutes then remove from heat. Allow to cool before using. Combine until a dough is formed. Cover and let rest for 30 minutes. Separate the perogie dough into two balls. Roll out one piece at a time on a lightly floured surface until it is very thin. 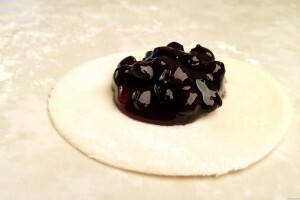 Using a cookie cutter or glass, cut out 2 inch circles in the dough. Brush a little water around the edges of the circles, and spoon some filling into the center. Fold the circles over into half-circles, and pinch edges to seal. Place perogies on a tea towel lined and floured cookie sheets and freeze. Once the perogies are frozen place them in freezer bags or cook. Bring a large pot of lightly salted water to a boil. Drop perogies in one at a time. They are done when they float to the top. Do not over cook as they will split and lose their filling. I like to toss them with a touch of oil and butter. You can serve them as is, with sour cream, fried bacon and onions or fry the perogies themselves to a nice golden brown. These look absolutely incredible. I never would have thought to use blueberry in something like this. Thanks for sharing! Sally, what a wonderful memory. Thank you for sharing it. I agree, it is shocking at the use of chemicals all around us. And in our food. If more people were aware of what they were putting into their bodies the push for organics would grow. I know some use the cost as a factor as to not shop orgaincally, claiming it to be more expensive. But truly, if they would just look at prices when they are purchasing their produce they would find it is on par with their chemically grown counterparts. I do garden and grown what I can. Perhaps someday I will live in a climate when I can garden year round. As always, thank you for stopping by Sally. The love comes in the filling. This line strikes such a chord. When I visited my Aunt in Poland we could not communicate well as I don’t speak Polish and she doesn’t speak English. We walked to the market and bought some wild blueberries. She made perogi and she, my sister and I all helped to roll and fill them. It’s a very important memory for me as we laughed and joked about the way we were filling them. My children were small at the time and loved the freshly made perogi eaten with smetana.